Yesterday, another prominent civil society figure was arrested in Azerbaijan as a Baku court authorized investigative journalist Khadija Ismayilova’s pre-trial detention for two months on bogus charges of “inciting suicide”. This shows that there is no end to the assault on independent voices by the government of this oil rich country and provides further proof of its disregard for founding values of the Council of Europe and its obligations under the European Convention on Human Rights. Khadija Ismayilova’s arrest followed a series of harassment against her and came the day after the head of the presidential administration published a lengthy article, accusing NGOs and media organisations of being “fifth columns.” Ms. Ismayilova was specifically accused of “wishing to please her foreign bosses.” These kind of accusations are a well-known tactic of discrediting those who challenge government policies but are especially troubling when coming from a high-ranking representative of the presidential administration. If found guilty on the charges she is facing, Ms. Ismayilova could be sentenced to up to seven years in prison. We welcome the reaction to her arrest of the president of the Parliamentary Assembly of the Council of Europe, Ms. Anne Brasseur, “urging the competent authorities to ensure that the standards of the (European) Convention are respected in any judicial and legal proceedings against Ms. Ismayilova as well as other leading human rights defenders”. Local and international civil society has, however, stopped believing in the goodwill of Azerbaijan’s government to abide by international human rights standards, especially after it used its recent chairmanship of the Committee of Ministers of the Council of Europe to further step up its crackdown on civil society. During this six-month period, a number of leading civil society representatives were arrested, convicted, prevented from travelling abroad and forced into hiding in retaliation for their criticism of official policies, including at Council of Europe events. Ms. Ismayilova is only the latest victim in this crackdown. 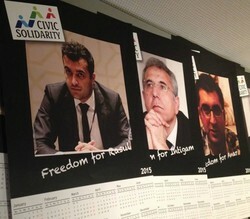 Calls made by Council of Europe representatives urging Azerbaijan to comply with its obligations as a member of this organisation, as well as decisions by the European Court of Human Rights finding violations in cases of imprisonment of critical voices (such as of political opposition member Ilgar Mammadov) have not brought about any change of course in Azerbaijan. It is now time for the Council of Europe to respond to the unprecedented situation in Azerbaijan in a firm and determined manner and to take concrete action to show that there can be no more “business as usual”. In our view, this is a matter of safeguarding the role and image of the Council of Europe as a value-bearer. We call on the Council of Europe to suspend Azerbaijan’s membership until the authorities of the country drop all charges and unconditionally release NGO representatives, lawyers, journalists and political opponents who are currently in detention or prison for their legitimate professional activities, including Khadija Ismayilova, Leyla Yunus, Rasul Jafarov, Intigam Aliyev, Anar Mammadli, Ilgar Mammadov and others. As long as the Azerbaijani government continues to flagrantly violate the European Convention on Human Rights and the commitments Azerbaijan undertook when it was admitted to the Council of Europe, it should not be allowed to participate in the work of this organisation, which prides itself as the region’s guardian of human rights, democracy and the rule of law. The Civic Solidarity Platform (CSP) is a network of human rights NGOs from Europe, North America and the former Soviet Union. For more information, see the website of the CSP.